measurements for a perfect fit and proper drainage. Using only the highest quality material available. With over 30-colors to choose from. We install our continuous gutters with hidden hangers and there are no seams or joints except at corners and where downspouts attach. Joints are made water-tight using a superior sealant. Downspouts are securely connected and firmly supported, fastened with cleats and the appropriate length screw to allow for a solid attachment. New gutters shall be K-style and Cascade Gutter Service, Inc. can fabricate gutter in either 5" for residential or 6" for commercial / larger roof sizes using 0.027" gauge aluminum with baked enamel finish and a corrosion preventative coating on side surface. Other gutter material available: Steal, acrylume, copper, or half-round copper. All materials are available with 2"x3", 3"x4", 2", and 3" downspouts. Water flows through the Drain Guard, while leaves and other roof debris remain in the mesh container of this easy to reach Drain Guard. Just open and empty for an easy way to keep underground drainage systems from clogging. Several types are available depending on the amount and type of trees (conifer needles or deciduous leaves) that may fall onto the roof and end up in the gutters. This type of leaf protection fits into any standard gutter. 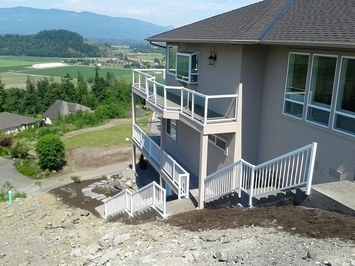 Combining long lasting aluminum posts and railing, with either 1/4" tempered glass panels, aluminum pickets, or 1/8" stainless steel cable, each railing system is strong, durable, weather resistant, and except for the occasional rinsing off, nearly maintenance free. "We have our minds in the gutter so you don't have to".